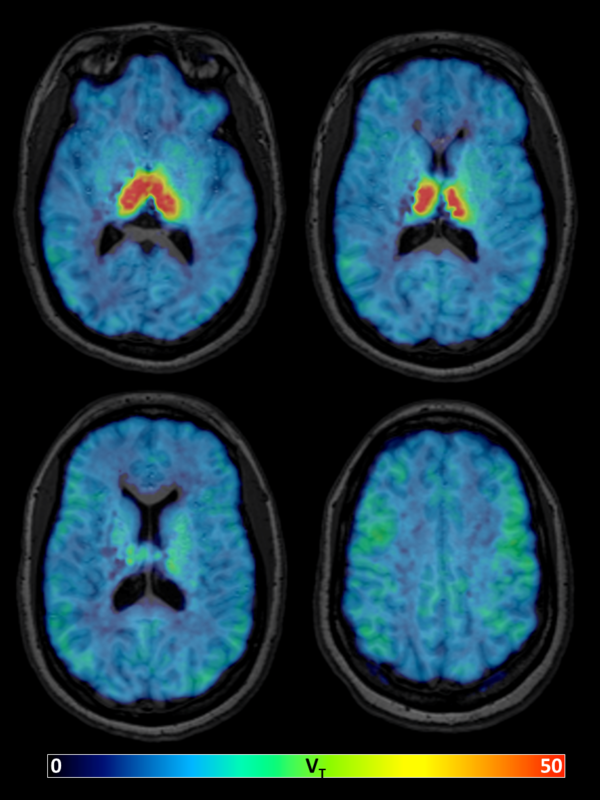 RESTON, Va. – A new PET imaging radiotracer could help researchers understand neurodegenerative disease and the aging brain. The study is featured in the October issue of The Journal of Nuclear Medicine. Past studies have shown a reduced density of the α4β2 nicotinic acetylcholine receptor (α4β2-nAChR) in the cortex and hippocampus of the brain in aging patients and those with neurodegenerative disease. The α4β2-nAChR is partly responsible for learning, and even a small loss of activity in this receptor can have wide-ranging effects on neurotransmission across neural circuits. However, fast and high-performing α4β2-nAChR-targeting radiotracers are scarce for imaging outside the thalamus, where the receptor is less densely expressed. A team at Johns Hopkins University assessed the pharmacokinetic behavior of 18F-XTRA, a new PET imaging radiotracer for the α4β2-nAChR. The researchers tested the new radiotracer on a group of 17 adults and focused on extrathalamic regions of the brain. The research team found that 18F-XTRA rapidly entered the brain and distributed quickly. The team said their findings will be important for future studies, especially in cases relating to neurodegeneration and aging, to monitor and assess changes in the human brain. FIGURE: Parametric images of the total distribution volume (VT) of 18F-XTRA, estimated using Logan graphical analysis with metabolite-corrected arterial input function and 90-minute data from one representative healthy participant. Authors of “18F-XTRA PET for Enhanced Imaging of the Extrathalamic α4β2 Nicotinic Acetylcholine Receptor” include Jennifer Coughlin, Stephanie Slania, Yong Du, Hailey Rosenthal, Wojciech Lesniak, Il Minn, Gwenn Smith, Robert Dannals, Hiroto Kuwabara, Dean Wong, Yuchuan Wang, Andrew Horti and Martin Pomper, Johns Hopkins Medical Institutions, Baltimore, Maryland.